A year ago I hiked a loop through the Cotswolds, an area in England known for its rolling farmland and quaint villages. 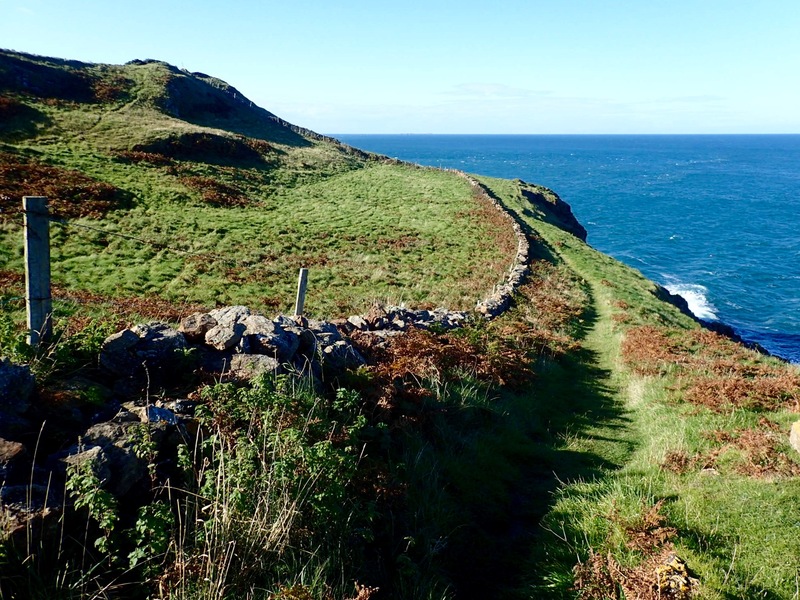 This year, I traipsed a section of the coastal path around Anglesey, an island off the northwest coast of Wales. The Isle of Anglesey was known as Mam Cymru (Mother of Wales) during the Middle Ages because the island’s fertile fields could feed the whole country. 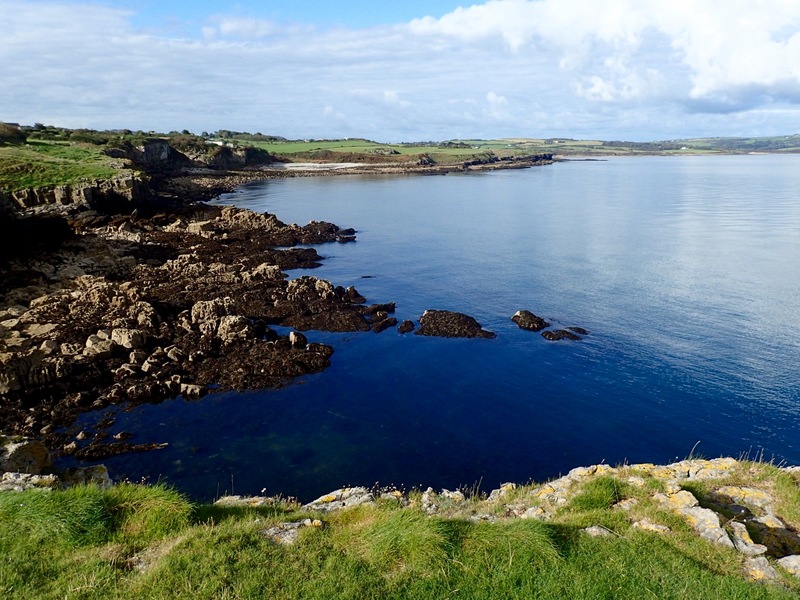 The trail around Anglesey is 128 miles long, passing through green pastures, scrubby heath, sand dunes, salt marshes, pebbly beaches, mud flats, towering bluffs and the occasional woods. Along the way I visited castles, ate fresh seafood and attempted to field questions from the Welsh about the US presidential election, a topic which endlessly fascinated them. The section of the path I chose started in Beaumaris and ended in Holyhead seven days later. The distance was sixty-four miles, not including the additional mileage between the trail and my lodgings. A tour company arranged the accommodations along the route and transported my bag every day. I just walked. 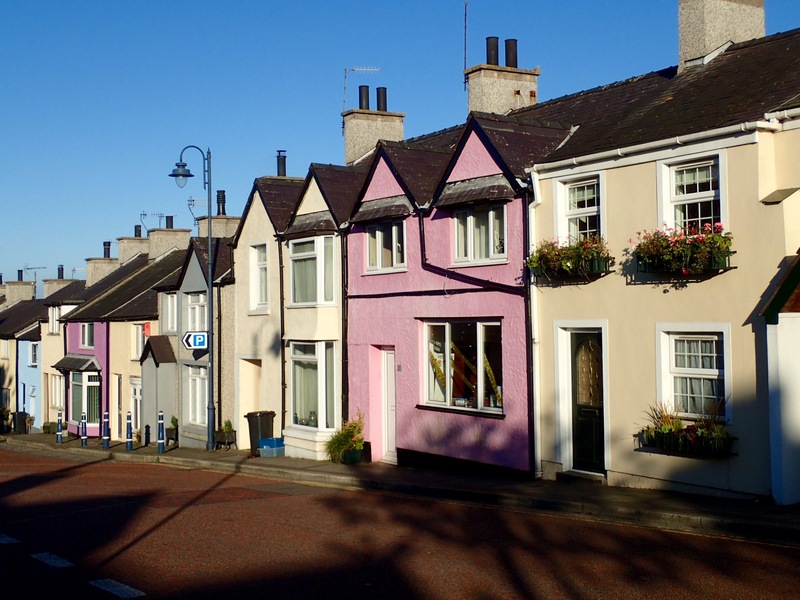 I arrived in Bangor, Wales, by train and took the bus to Beaumaris, passing through the village of Llanfair­pwllgwyngyll­gogery­chwyrn­drobwll­llan­tysilio­gogo­goch. Not kidding. Contrived for marketing purposes in the 1860s, the village’s place-name is the second longest in the world. Translated, it means “the Church of St. Mary in the hollow of white hazel near the rapid whirlpool and the Church of St. Tysilio by the red cave.” Locally, its called Llanfair PG. From the harbor in Beaumaris I could see the mountains of Snowdonia National Park across the Menai Strait. The town is popular with tourists, offering a waterfront promenade, restaurants, a castle and some really old houses. One dates to 1400, one of the oldest in Great Britain. At the busy Central Bakery, where locals queued to buy fresh bread, I bought a cottage pie and some Welsh cakes with currants. Families were crabbing and flying kites at the pier. 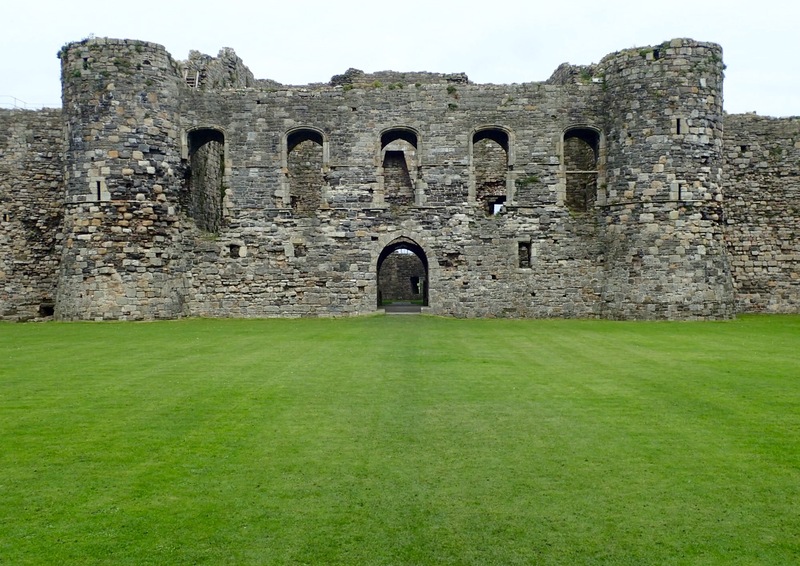 The name Beaumaris is a corruption of beaux marais, translating to “beautiful marshes.” King Edward I of England started construction on Beaumaris Castle in 1295, adding it to his collection of forts intended to quell rebellious northern Wales. Built on flat land, its walls and moat are beautifully symmetric, like a perfect sandcastle. War in Scotland, however, changed the king’s priorities, so he shifted his resources. Construction of the “The Greatest Castle Never Built” stopped in 1330. Though unfinished, it’s a massive structure and a UNESCO World Heritage Site. Another fortress, Beaumaris Gaol, held convicts during the 1800s. A museum in the jail describes the harsh life of the inmates. The prisoners’ cells, work yard, punishment cells, whipping rack and chapel are preserved as they were. I started the hike early under overcast skies, stepping carefully through sheep pastures and walking along rocky beaches, piled with seaweed. No one out but dog walkers. 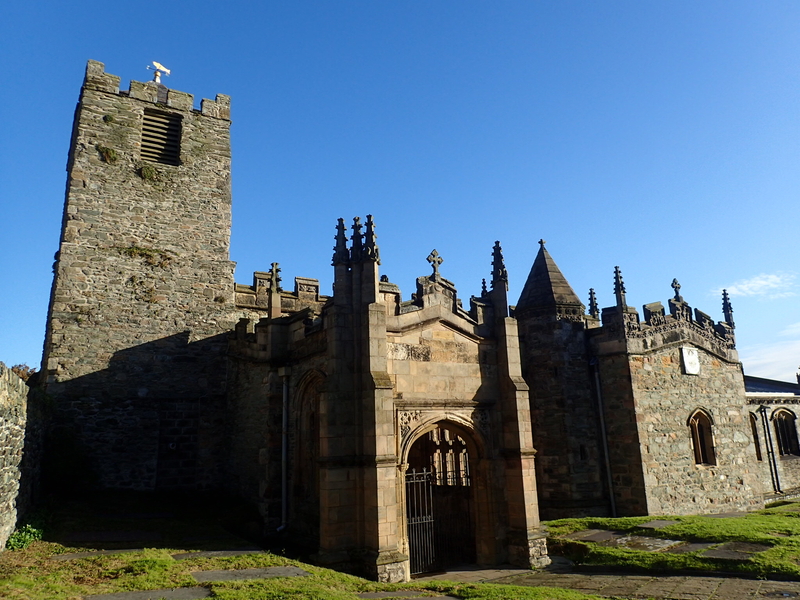 At Penmon Priory they were preparing for Sunday service, but directed me to the “historic part of the church.” The priory is on the site of the hermitage of Saint Seiriol, dating to the 500s CE. Inside are two Celtic stone crosses from around 1000 CE, now protected from the weather. The nearby dovecote was built around 1600 and once held up to a thousand birds. 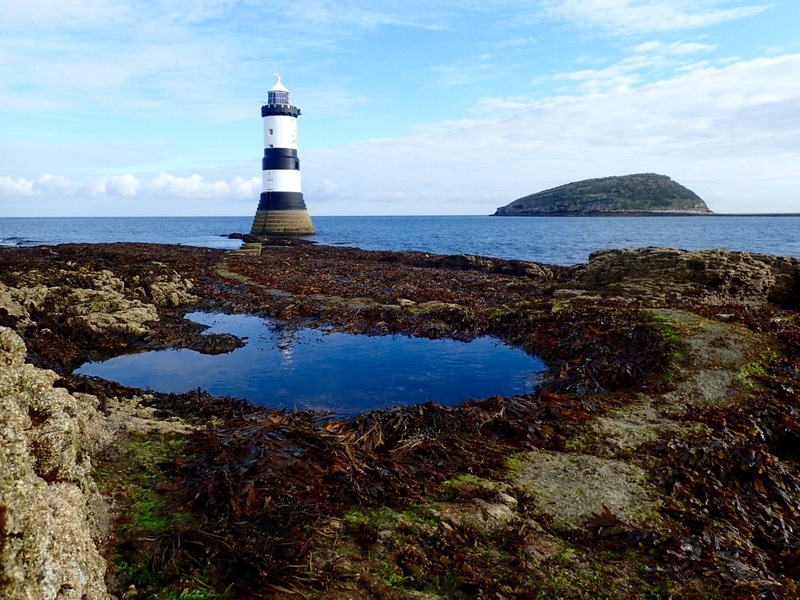 Stopped at Penmon Point and the lighthouse, overlooking Puffin Island, a seabird sanctuary. Divers, anglers and kayakers were prepping for their days’ adventures. Ate lunch while sitting on a stile, then walked past Bwrdd Arthur (Arthur’s Table), the site of an Iron-Age hillfort. 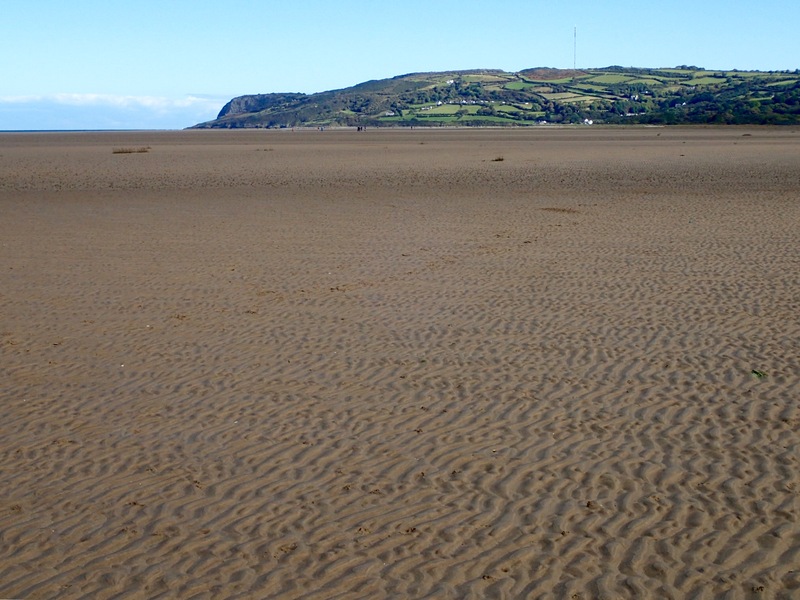 Upon arriving at Red Wharf Bay, I decided to cross the broad mud flats directly to the village on the far side, rather than following the longer path around the bay. At low tide nearly ten-square miles of the bay is uncovered. When I was about two miles across, I noticed the tide had begun to flow. A streamlet formed between the shore and me. The streamlet grew to a stream. I tried to walk around the front of it, but the tide was faster. The water deepened quickly and I found myself stranded in sight of the beach. Finally, I removed my shoes and socks and waded knee-deep though oozy mud to get ashore. This miscalculation added a couple of miles and an hour to the day. Rain fell overnight. 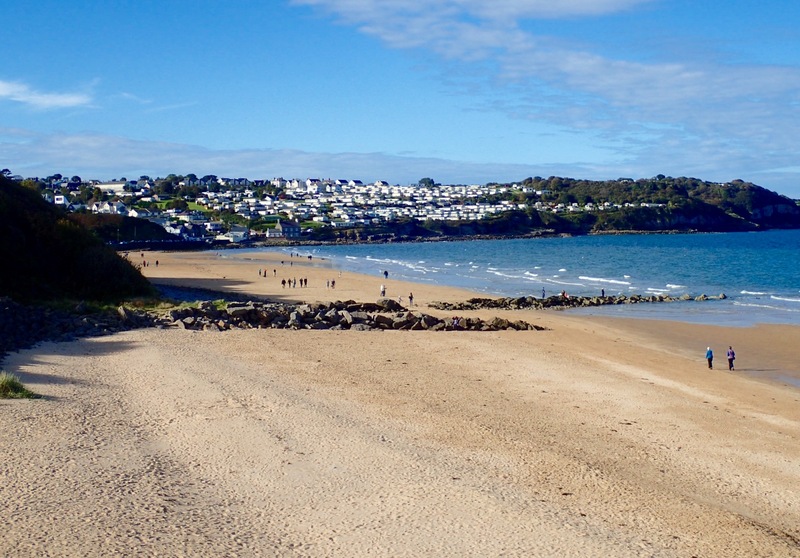 I continued my walk along the coast, sometimes on beach pebbles, sometimes on slippery rocks or wet grass. I flushed scores of huge pheasants, as big as turkeys, fat on field grain. They ran like roadrunners. Not sure they could get off the ground, even if they wanted to. Over half of a million Welsh, about a fifth of the total population, speak the Welsh language. On Anglesey, the percentage who speak Welsh is high, at least two-thirds. Sometimes they spoke Welsh to me, mistaking me for a local. The Welsh language has twenty letters, omitting j, k, q, v, x and z. Many of their words are formed with consonant combinations (I often wanted to buy a vowel), which are difficult for most English speakers to pronounce. The names of some places I stayed or visited: Benllech, Amlwch, Trwyn Cerrigyreryr, Ynys y Fydlyn and Llanfachraeth. Signage was in Welsh first, English second. 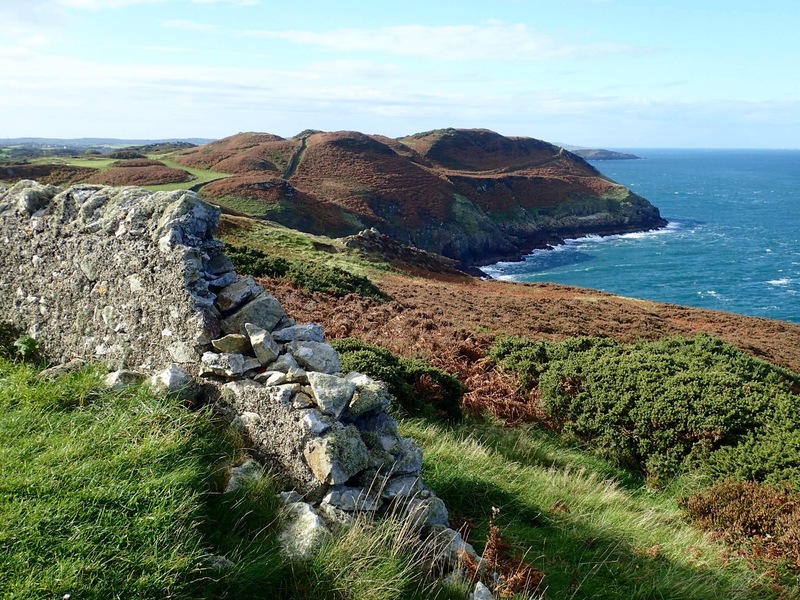 While hiking, I soon learned a few geographic terms, such as porth (harbor), traeth (shore) and bryn (hill). Passed through Moelfre, a village known for saving lives. 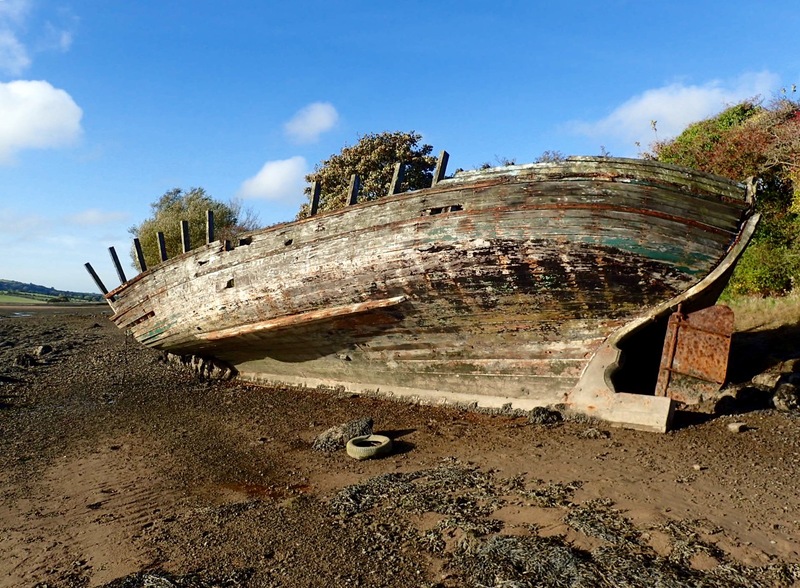 Several ships have wrecked on the treacherous rocks along the coast of Anglesey and the locals have frequently been called upon to help. I passed monuments to various ships, such as the Royal Charter, which wrecked in 1859, killing over 450. Statues and plaques honor local heroes involved in lifesaving. After a day spent on grassy cliffs overlooking the sea, I arrived at the Pilot Boat Inn near Dulas. 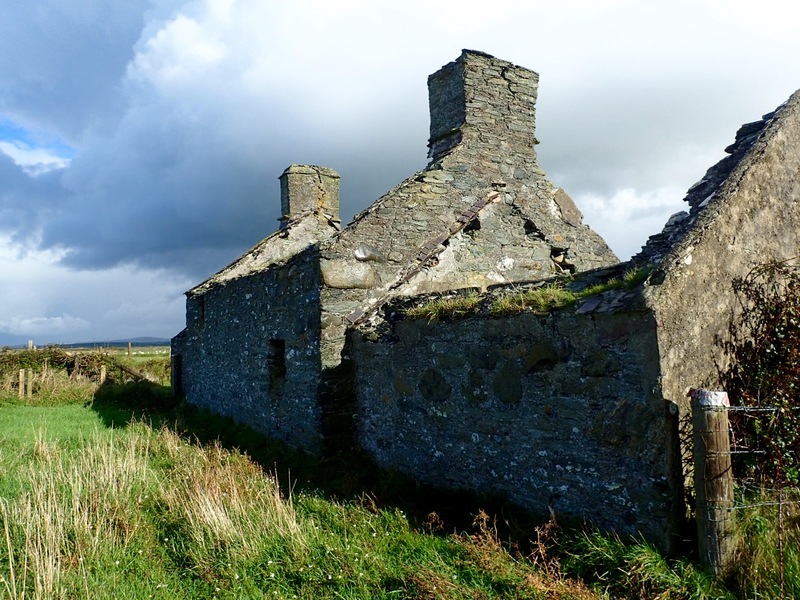 Due to the lack of available lodging in the area, the walking-tour company arranged for a taxi to transport me from the inn to Amlwch for the night. At the hotel bar that evening, I local named Nick helped me with the Welsh pronunciation of place names. Nick is a former merchant marine and a lover of music. He claims to have autographs of the Beatles from 1967, when they arrived by train in Bangor to attend a transcendental-meditation seminar with the Maharishi Mahesh Yogi. Nick’s parents worked for the railroad, which provided him access to its famous passengers. In the party were Mick Jagger, Marianne Faithfull and Donovan. A huge crowd met the Beatles at the station in Bangor, he said. Due to their last-minute decision to attend, they had to sleep in a rented school along with the other students of the Maharishi. While in Bangor, the Beatles received word of the death of their manager, Brian Epstein, due to a drug overdose. The next day I was returned by taxi back to Dulas to continue hiking the route. A beautiful sunny morning. Walked through the mud and marshes of Traeth Dulas and the wet grass of the adjoining pastures. After passing through some quiet country lanes lined with churches and country estates, I reached the coast again and climbed cliffs the rest of the day. Stopped at the Point Lunas Lighthouse, where attractive vacation cottages are for rent in the lighthouse compound. I found Ffynnon Eilian, the so-called holy well of Saint Eilian, a secluded spot reachable only by hiking. Finally, I arrived back in Amlwch. In the late 1700s, the town’s population was around ten-thousand. Amlwch was once the second largest town in Wales, due to its proximity to Parys Mountain, site of the world’s biggest copper mine. Tonight was poker night at the hotel’s pub. A group of women diners unknowingly commandeered the corner table where the game was usually played, which exasperated the regular male players. They begrudgingly moved the game. The Welsh and British are mesmerized by the US presidential race. They keep up with the latest twists and turns, as if following the plot of a long-running soap opera. Everyone I spoke with asked me about it, “probably to take our minds off of our own mess,” one said. While I was pleased to avoid most of the campaign negativity for a while, many of the Welsh recorded the recent debate in order to watch it the next day. The whole world seems concerned. As I was going to breakfast, the hotel’s owner/chef informed me his wife would do the cooking as he had cut himself in the kitchen. “So I shouldn’t have the blood sausage then?” I said. Rejoined the coastal path. I spent most of the day hiking along the edges of steep cliffs, often feeling a little shaky as I looked down at the waves crashing on the rocks below. The path was only a foot wide and a foot away from the precipice. And my ankle was sore and uncertain. Nine days before the start of the hike, I sprained an ankle in a trail-relay race. The daily mileage of the hike certainly challenged its healing. Every evening the ankle was angry. Every morning it forgave me enough to start again. I was not able to cool it down, as ice is not readily available. The Welsh and British are not as fond of ice as Americans are. Huge rock slabs protrude from the water along the coast like shark fins. Rows of them stand on edge, connected to the cliffs with deep fissures between them. Geologists believe they are between 500- and 700-million years old. Above the sea, the mountainsides are covered with gorse, heather and bracken. When I arrived at the headland of Trwynbychan, the bay of Porth Wen came into view. On the far side is a brick factory, abandoned in 1924. Later in the day, I chatted with an elderly man in the hotel bar before dinner. He told me as a teenager he used to hike from Amlwch to Porth Wen with his mates. Once, they found a mining cart at the abandoned brickworks. The group of them managed to push it up the tracks to the top of the hill, where the quartzite was mined. When they released the cart, it careened down the rails, à la Indiana Jones and the Temple of Doom. At the bend it jumped the tracks and disappeared into the bay. 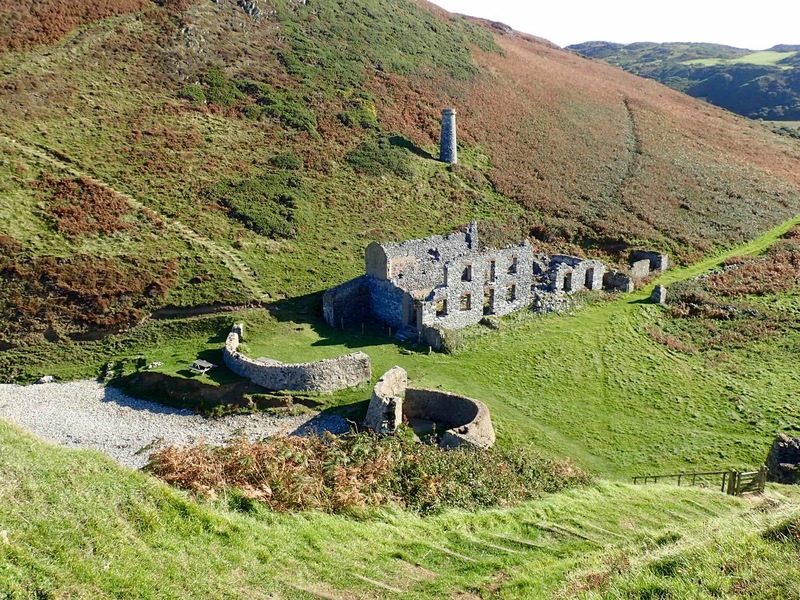 At the top of Llanlleiana Head I found the remains of a summer roost, which once belonged to the prominent Stanley family, active in British politics. Further on, I visited Llanbadrig Church. Supposedly Saint Patrick was shipwrecked nearby and built the church in thanks for his rescue. The site dates to 440 CE. Walked into Cemaes, a pleasant town with a large sandy beach. 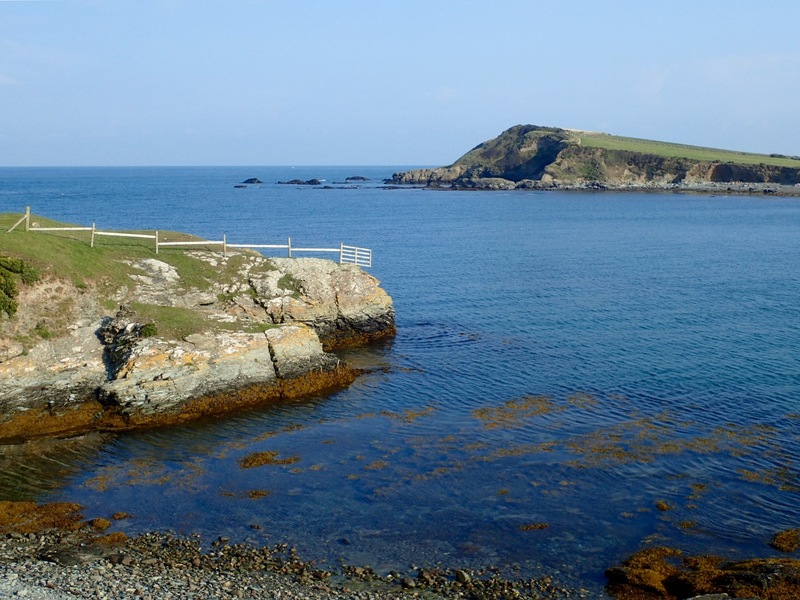 Cemaes is the northernmost village in Wales. At the Woburn Hill Hotel, the owner Amanda offered to do my muddy laundry while I strolled the beach with the dog walkers. Another sunny day. 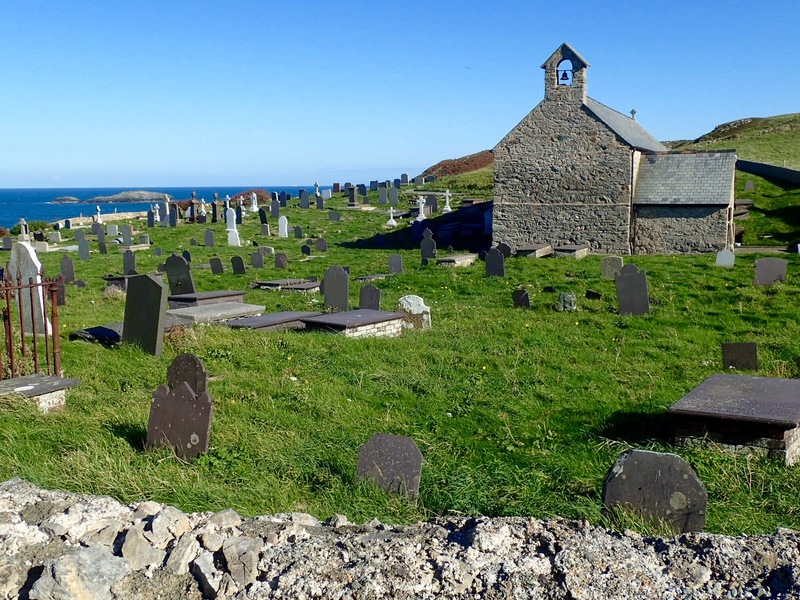 I left Cemaes early, anxious to explore Wales’ most remote section of coast. Much of it is owned by the National Trust. At Cemlyn Bay, I crossed the causeway of pebbles. On the inland side of the causeway is a brackish lagoon, which serves as a bird sanctuary. Among many breeding seabirds is Britain’s largest colony of Sandwich terns. Most of the rest of the day was spent on delightful grassy cliff tops overlooking the sea and various rock formations. Northwest of Carmel Head I could see the lighthouse stations on the Skerries. Eventually Holy Island and Holyhead Mountain came into view across the Cymyran Strait. Ferries glided in and out of port. 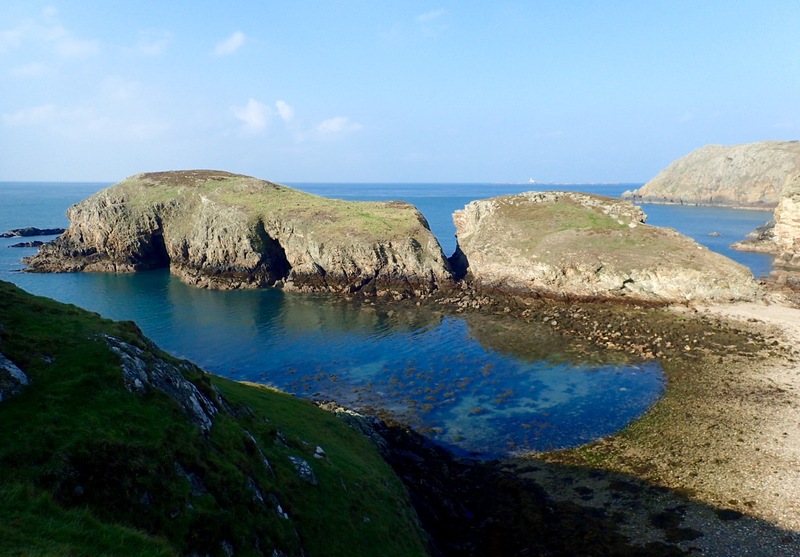 I descended the cliffs to the tiny island of Ynys y Fydlyn and its hidden stone arch. Arrived at Church Bay, a tiny hamlet, and my lodging at a farm called Pen-y-Graig. Mark, the owner, showed me my apartment in a converted barn, built in 1860. A main room with kitchenette and an adjoining bedroom. White-plastered stone walls, wood-beam ceilings and plank floors. 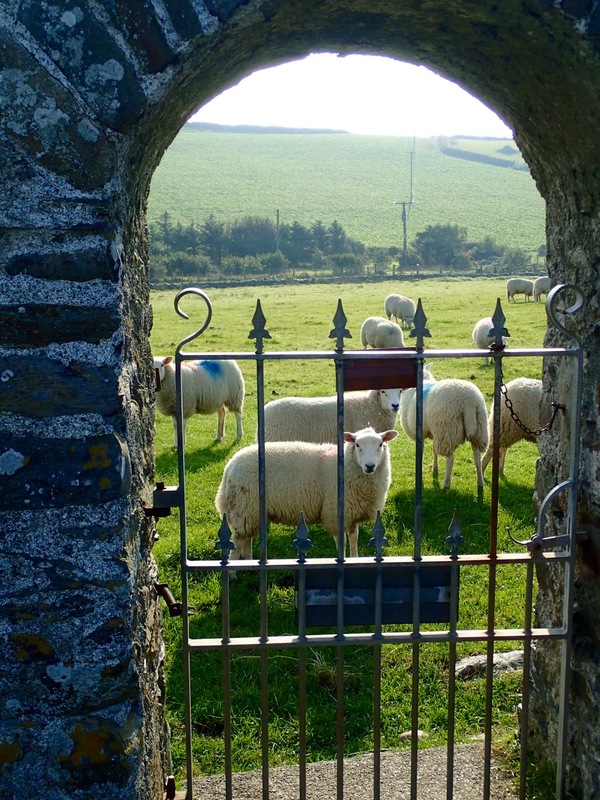 The windows overlook the sea and a pasture full of sheep. Mark’s wife, Victoria, arrived with some breakfast groceries and took my order for a packed lunch. She set the electric heaters to turn on automatically in the morning. Armed with a “torch,” I walked down the lane and along a path to the Lobster Pot, the only restaurant for miles. And a good one. The lobsters are caught by local fishermen. The owner rows out to his own pots. No engine. Walked home in the dark–a dark path, dark road, dark barnyard and dark apartment. At 6:30 a.m. the rain on the skylight over my head woke me. I layered on the rain gear. Victoria met me at the entrance of the farm with a packed lunch and I started down the trail. The footing was tricky–slippery rocks and mud. I walked stretches of beach and crossed meadows, grateful the rain arrived on a day with few cliffs to climb. Eventually, the sun emerged. As soon as I stowed my soggy rain kit, the rain was back, harder this time, and soaked me again. I arrived at the tidal estuary, Afon Alaw, and followed its northern bank. In Llanfachraeth I headed out of the village on the main road and arrived at another farm, Pen-yr-Orsedd. The large stone farmhouse was built in the 1700s. I rested in the sun on a bench outside the front door, where the farm dog, a yellow lab named Max, found me and begged for head rubs. Joyce, the owner, welcomed me into the farmhouse with a pot of hot tea and a slice of chocolate cake. She hung up my rain gear to dry and set my wet shoes by the stove. Later I met her husband, Emlyn, the third generation to farm 360-acre Pen-yr-Orsedd. They have four sons, including one who lives next door and helps with the farm. They raise sheep and cattle, fattening them on Wales’ renewable supply of lush green grass. Last day on the path. Joyce returned my hiking shoes and rain gear, dry. Bought a picnic lunch at the convenience store in Llanfachraeth. I returned to the footbridge over Afon Alaw or, rather, I tried to, but the path was underwater. The tide was coming in. I backtracked to Llanfachreath and walked the main road to the coast. It showered again and I quickly put on my rain clothes in a handy bus shelter. Crossed the long Stanley Embankment over the Cymyran Strait to Holy Island. Ate my lunch at a bench in the Oenrhos Coastal Park, once the site of the Stanley family’s estate, and watched it rain on the far Anglesey shore. In Holyhead, I inspected the wall of a small fort, constructed by the Romans in the 300s and still standing. The Romans built the fort to protect their settlement against sea raiders. A watchtower on top of Holyhead Mountain signaled when an enemy force approached. In less than a hundred years, the Romans withdrew. In the 500s King Maelgwyn gave the property to Saint Cybi, who established a monastery. The Church of Saint Cybi, built in the 1200s, stands on the site today. 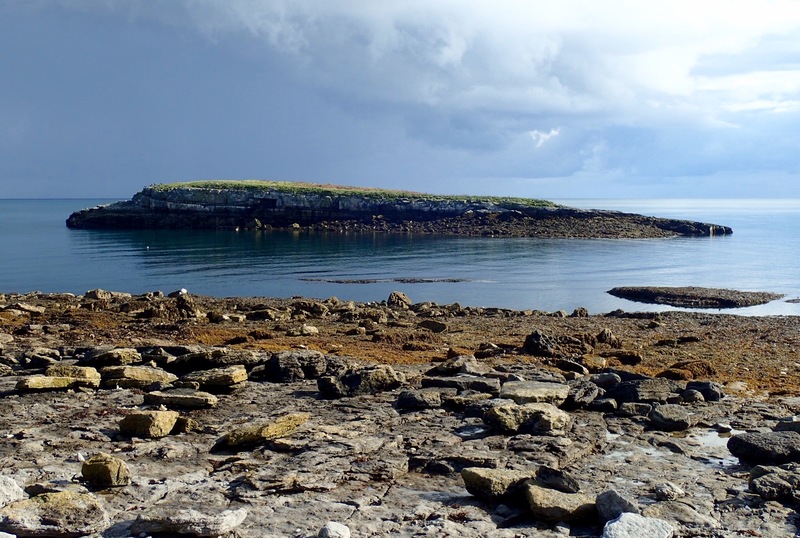 Holyhead is the largest town on Anglesey with a population of around twelve-thousand. It is a busy transport hub, with ferries running to Ireland and trains to London. John, owner of my B&B in Holyhead, told me a story about two of his guests: In 2012 a Canadian couple was hiking the coastal path. The wife fell and broke her leg. As they didn’t have a working mobile phone, the husband signaled a passing fishing boat. The boat called for a rescue. Because the area is inaccessible, a helicopter was scrambled. The couple was plucked from the cliff and airlifted to a hospital in Bangor, where the wife had surgery. The chopper pilot, who was serving with the Royal Air Force’s Search and Rescue Force at the time, was Prince William. A prince to the rescue. Almost a fairy tale, except for the air-ambulance bill. Looks like a great experience, sans rain. We did a 6-day hike of the Dingle peninsula in Ireland this summer. Wet and wet. Your experience with rain, coastal areas and beaches sounded familiar. So fun to read of your travels. Thanks, Teresa. I’d like to hike Ireland at some point too.